11 January 2010, at 9:44a.m. 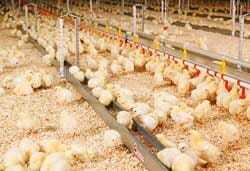 GERMANY - As part of an in-company open day, Rothkötter Kraftfutterwerk GmbH recently inaugurated its new pullet rearing farm, which includes a turn-key building and equipment from Big Dutchman. 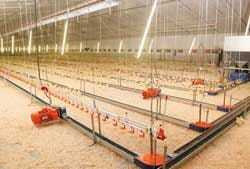 The impressive system provides space for 84,000 animals which, following the period of raising, are used for producing hatching eggs for broiler breeder production. The Meppen-based company contracted Big Dutchman to provide the turn-key building as well as the equipment for the five different houses. The firm posts of the automatic chain feed system are made of stainless steel and have a long service life. Jumping is not innate - it has to be learned: once the animals have reached the right age, the jumping tables (formerly pulled up to the ceiling of the housing – see ceiling centre) are lowered for practice purposes. With Amacs, the farm manager can control all the important functional areas of the houses by means of a mouse click – from the local office as on the photo, if necessary however, also from any location anywhere in the world. A combination of successfully tried and tested Big Dutchman classic solutions and modern computer technologies ensure optimum rearing conditions. The oldest feature is the Champion feed chain, which is 70 years old and as such Big Dutchman's 'most senior' best-selling product world-wide. It distributes the feed evenly, quickly and reliably throughout the entire house. 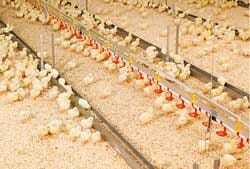 As the chain brings the feed to the animals feed separation is prevented, thus resulting in standard animal weight. 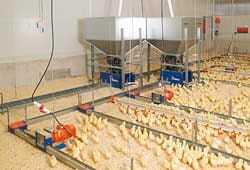 The automatic chain feeding system is erected on firm stainless steel posts and can be raised as required, e.g. in the case of vaccination programmes. Furthermore, all cables – such as traction and suspension cables – which are used in the houses are made of stainless steel; this guarantees a long service life. Some decades younger, but nevertheless equally efficient, is the Amacs management and control system: specially developed software based on modern internet technology makes it possible for the farm manager to control all essential functional areas by mouse click – and, if necessary, this can be done from any location in the world. 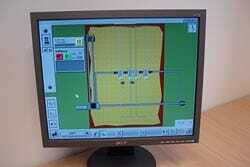 Amacs belongs to a new generation of computer-controlled farm management systems. The Big Dutchman innovation works on the basis of network techniques and modern communication technologies. This enables permanent data collection, monitoring and control of the houses in real time – even by Smartphone (I-Phone). It is possible for all the houses of one enterprise at one single location or even at several different ones to be controlled at the same time either locally on the spot, or by remote control. The technology as well as the graphic visualisation are user-friendly, and thus guarantee effective house management in respect of feeding, water supply, house climate etc. with the correspondingly positive effects on labour time and effort of the farm employees. Further advantages of the system are that Amacs is suitable for small as well as large houses, it can be adapted to suit specific local circumstances and can be expanded at any time. Furthermore, the system makes it possible to keep a constant overview of stock; the acquired data are stored centrally and are thus available for purposes of comparison, which makes it possible to optimise animal performance. Alarm messages via e-mail to a mobile phone represent a further performance feature of Amacs.